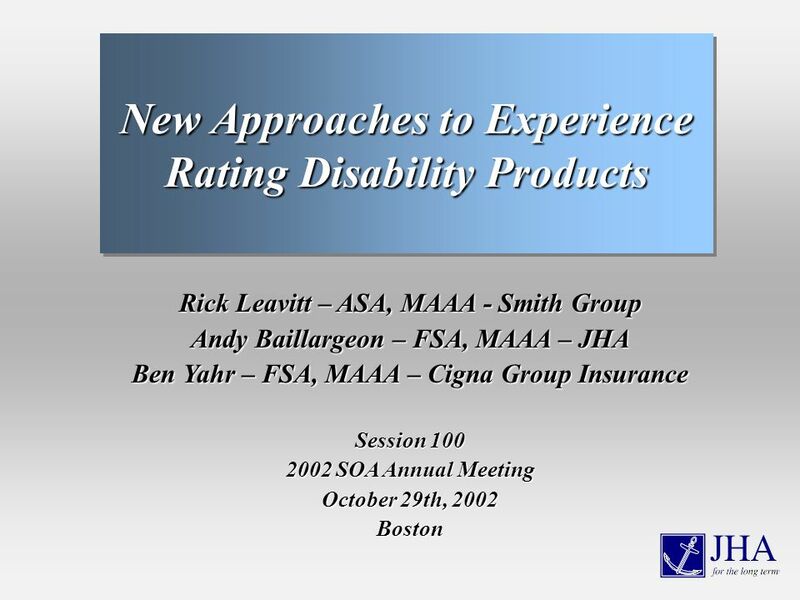 Rick Leavitt – ASA, MAAA - Smith Group Andy Baillargeon – FSA, MAAA – JHA Ben Yahr – FSA, MAAA – Cigna Group Insurance Session 100 2002 SOA Annual Meeting. 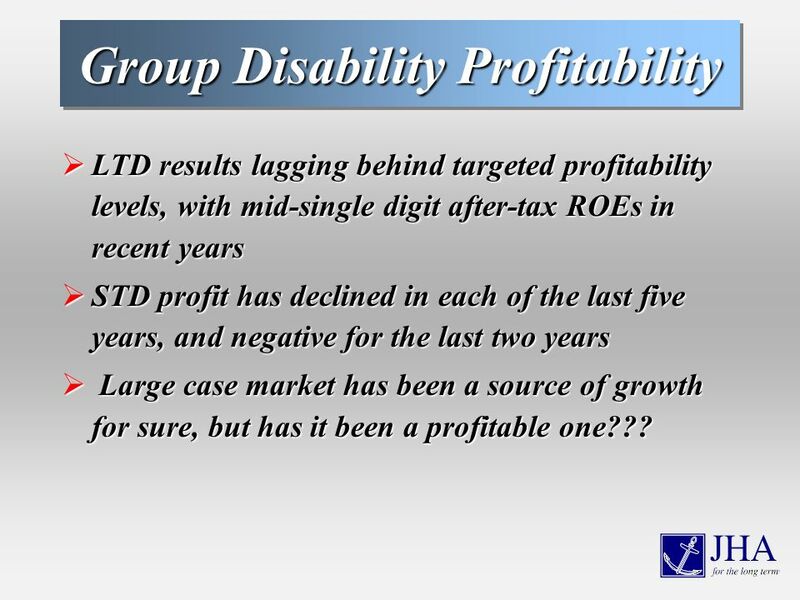 7 Group Disability Profitability LTD results lagging behind targeted profitability levels, with mid-single digit after-tax ROEs in recent years LTD results lagging behind targeted profitability levels, with mid-single digit after-tax ROEs in recent years STD profit has declined in each of the last five years, and negative for the last two years STD profit has declined in each of the last five years, and negative for the last two years Large case market has been a source of growth for sure, but has it been a profitable one??? 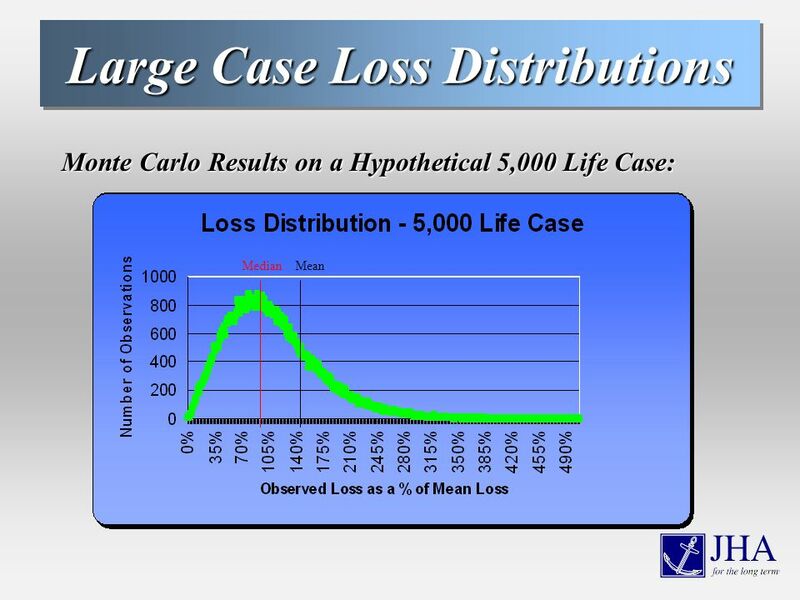 Large case market has been a source of growth for sure, but has it been a profitable one??? 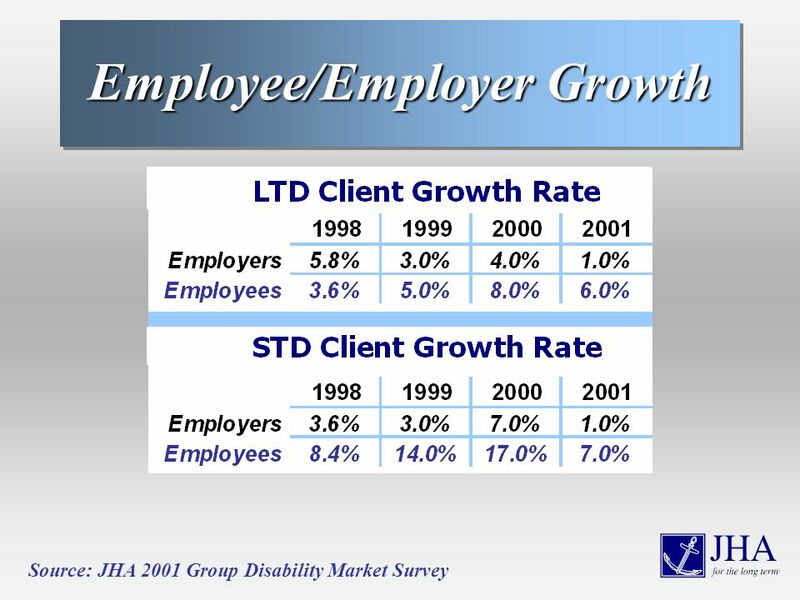 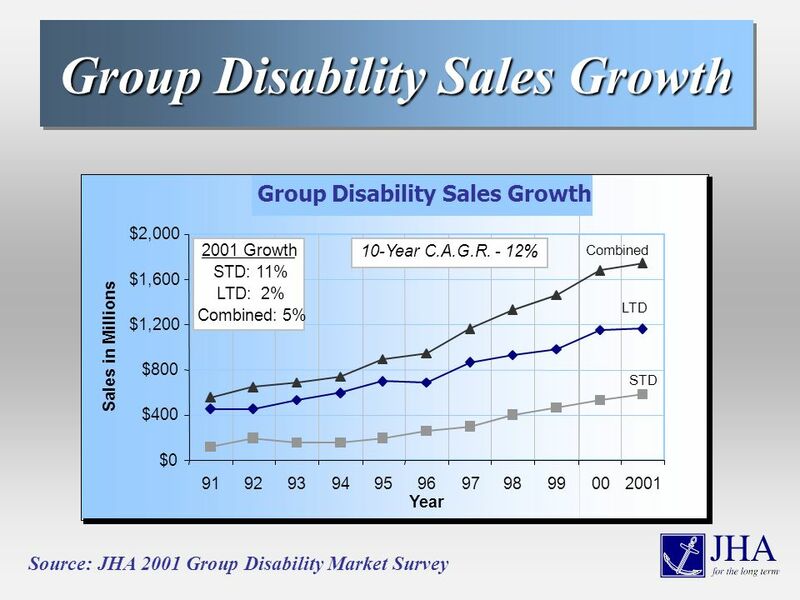 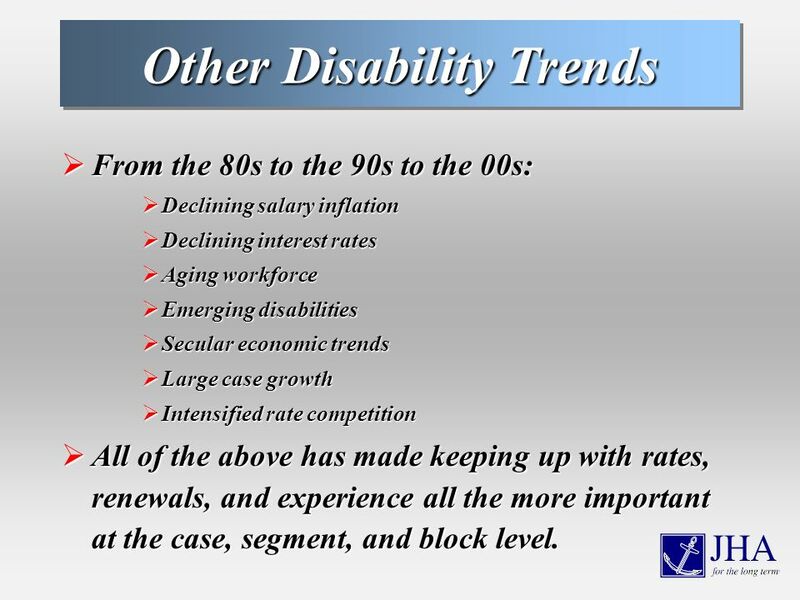 8 Other Disability Trends From the 80s to the 90s to the 00s: From the 80s to the 90s to the 00s: Declining salary inflation Declining salary inflation Declining interest rates Declining interest rates Aging workforce Aging workforce Emerging disabilities Emerging disabilities Secular economic trends Secular economic trends Large case growth Large case growth Intensified rate competition Intensified rate competition All of the above has made keeping up with rates, renewals, and experience all the more important at the case, segment, and block level. 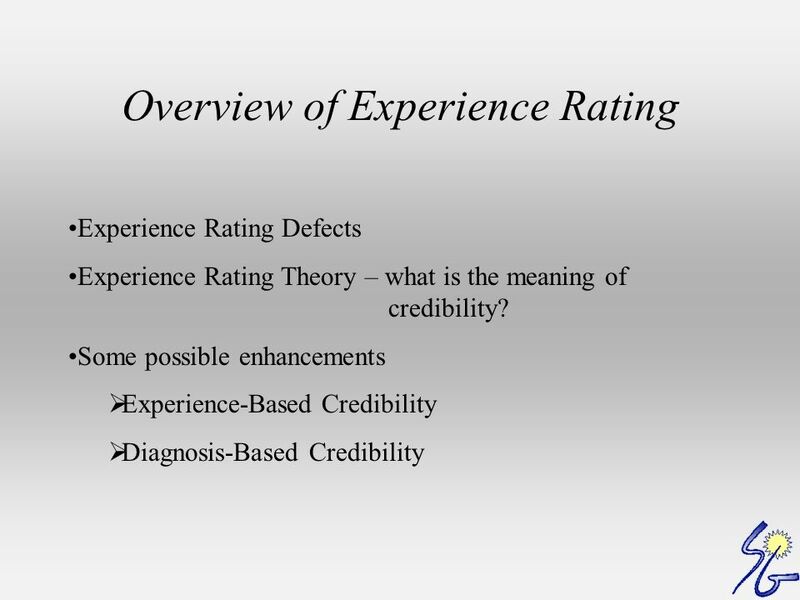 All of the above has made keeping up with rates, renewals, and experience all the more important at the case, segment, and block level. 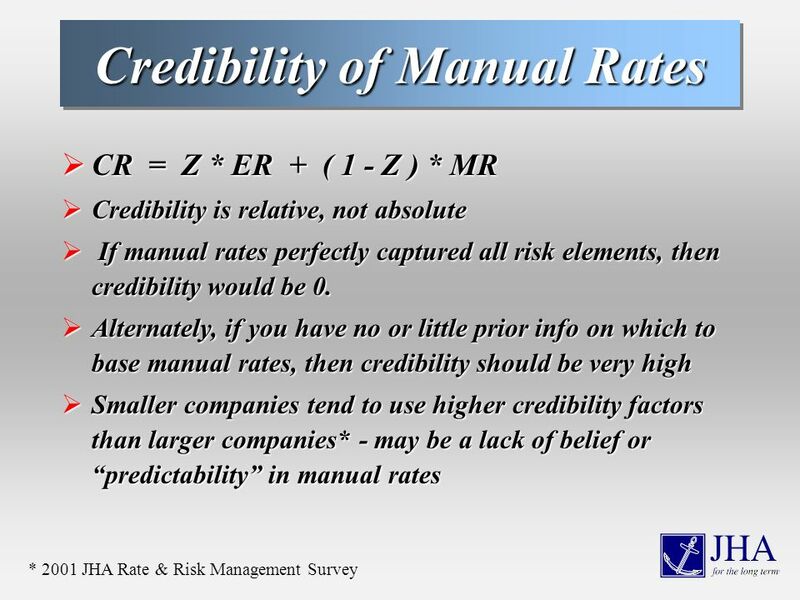 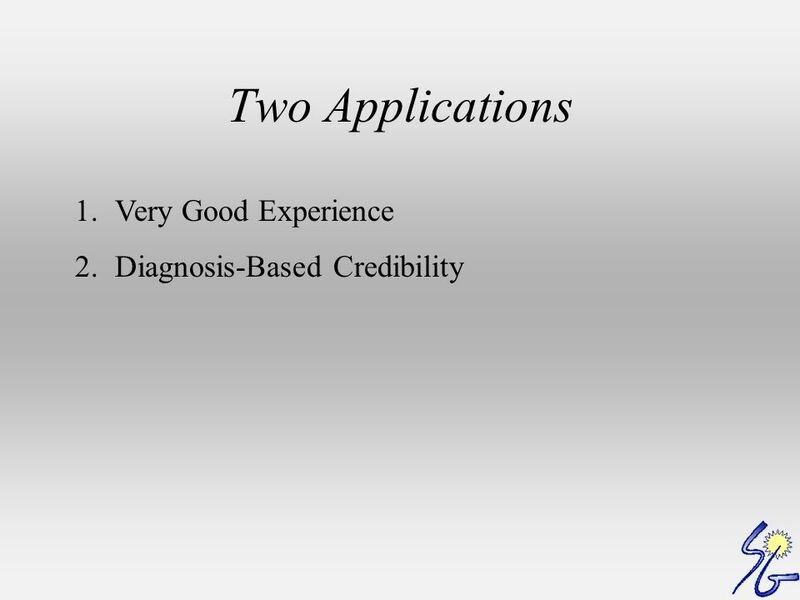 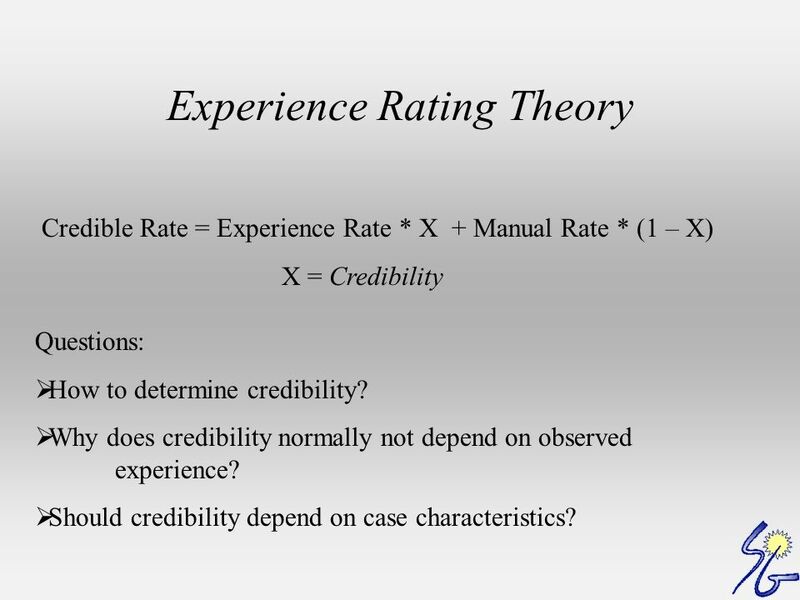 11 Experience Rating Theory Credible Rate = Experience Rate * X + Manual Rate * (1 – X) X = Credibility Questions: How to determine credibility? 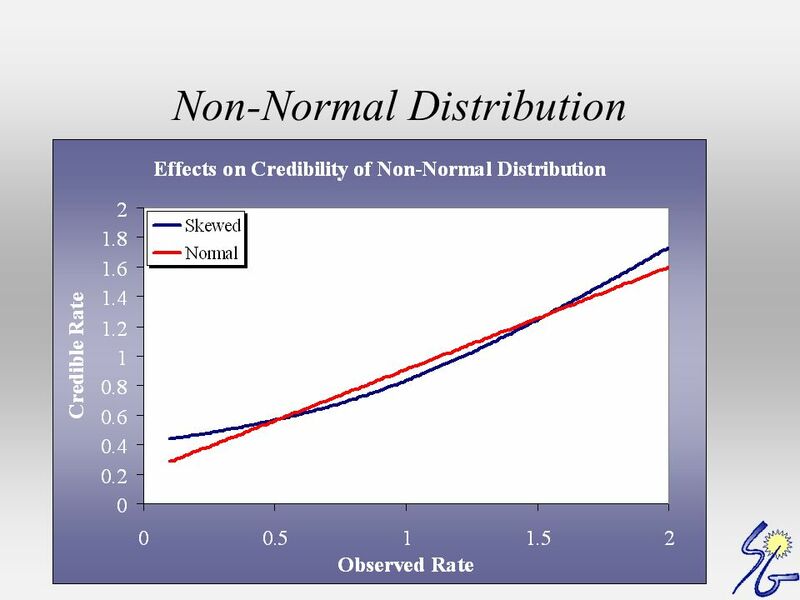 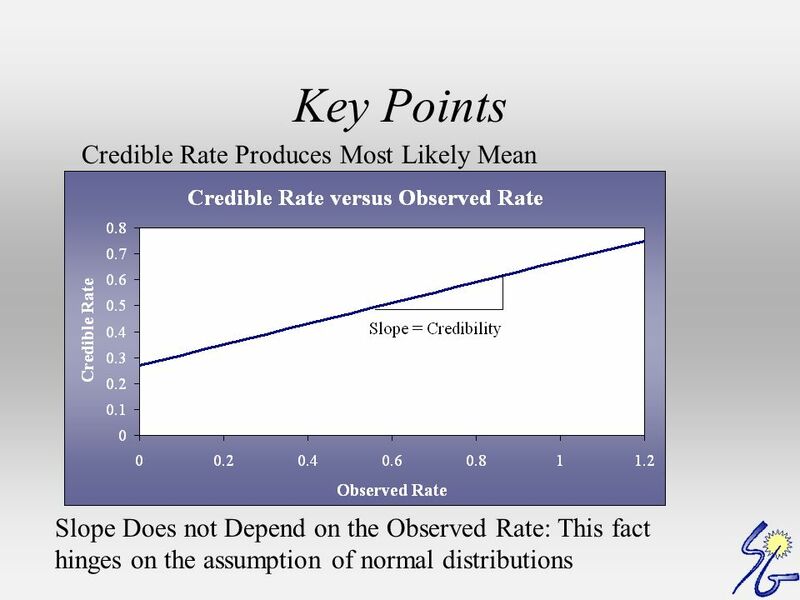 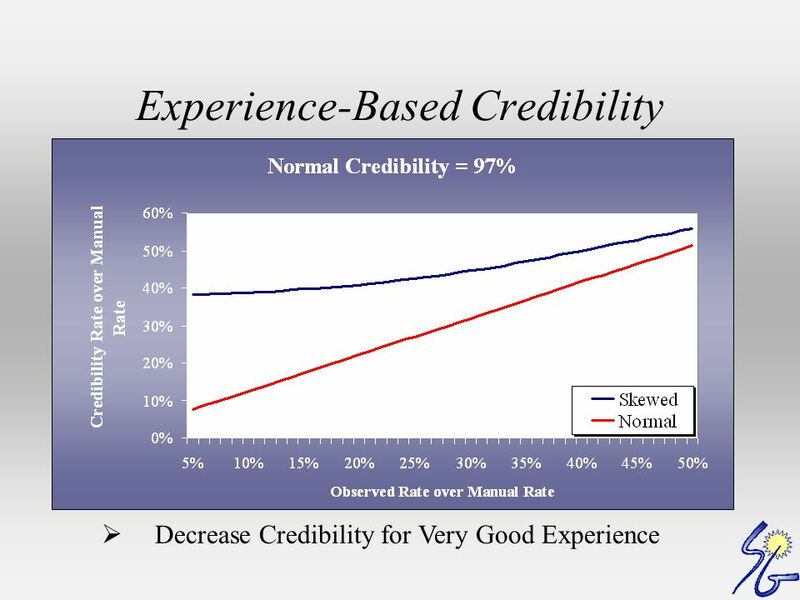 Why does credibility normally not depend on observed experience? 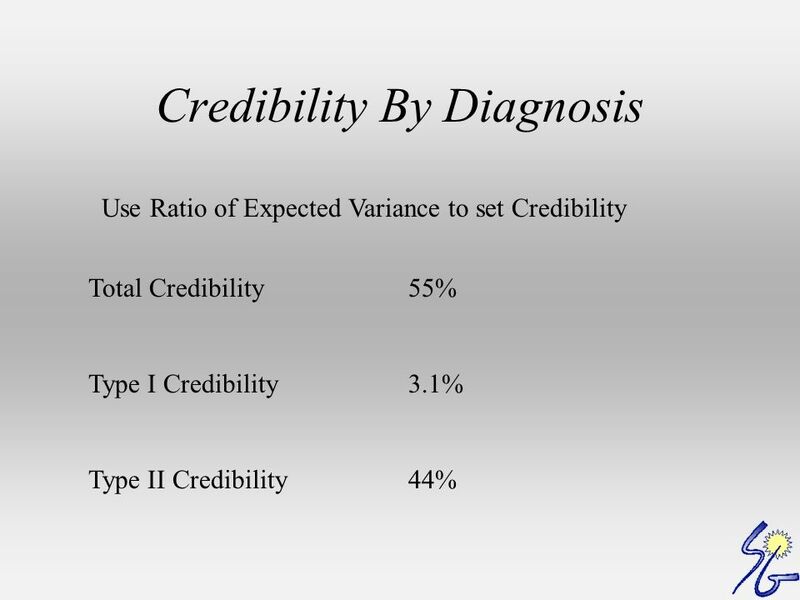 Should credibility depend on case characteristics? 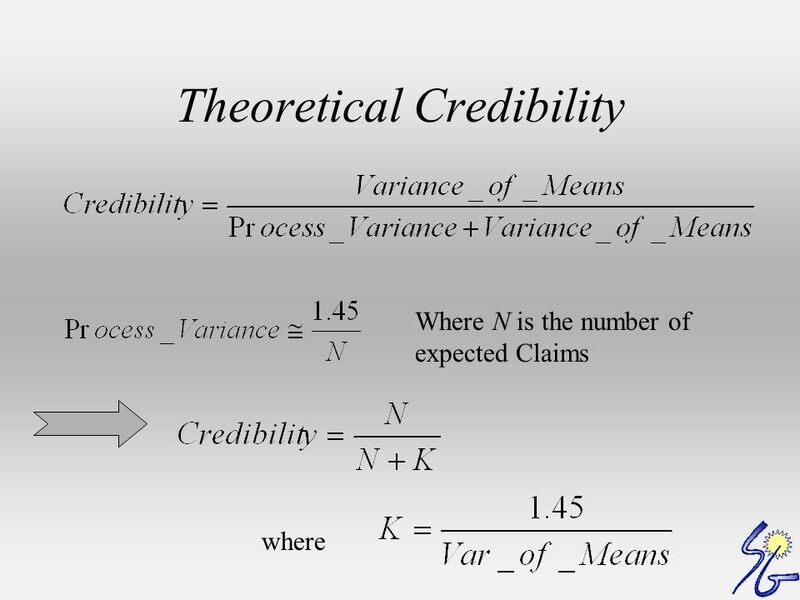 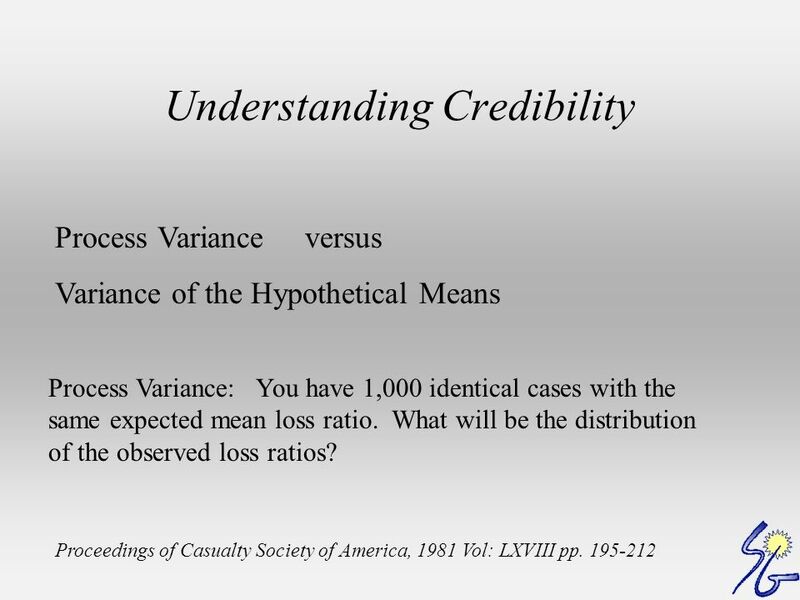 12 Understanding Credibility Process Variance versus Variance of the Hypothetical Means Proceedings of Casualty Society of America, 1981 Vol: LXVIII pp. 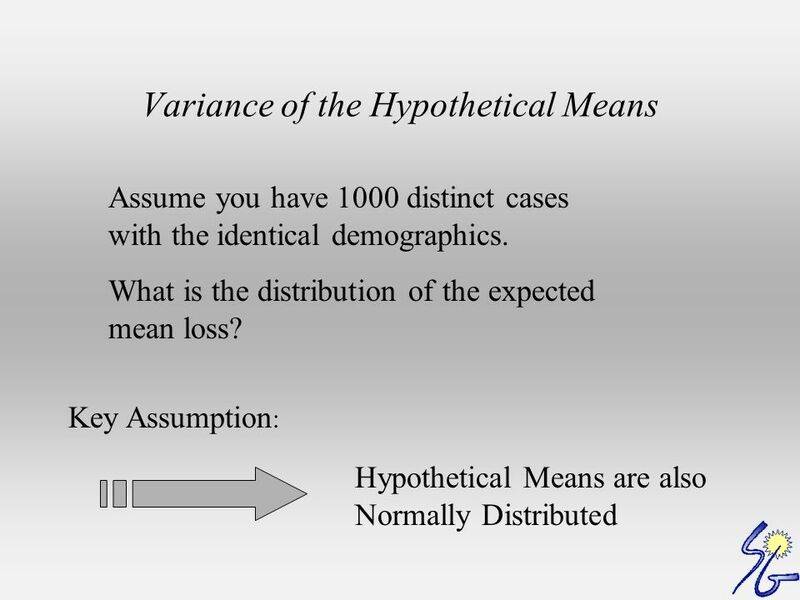 195-212 Process Variance: You have 1,000 identical cases with the same expected mean loss ratio. 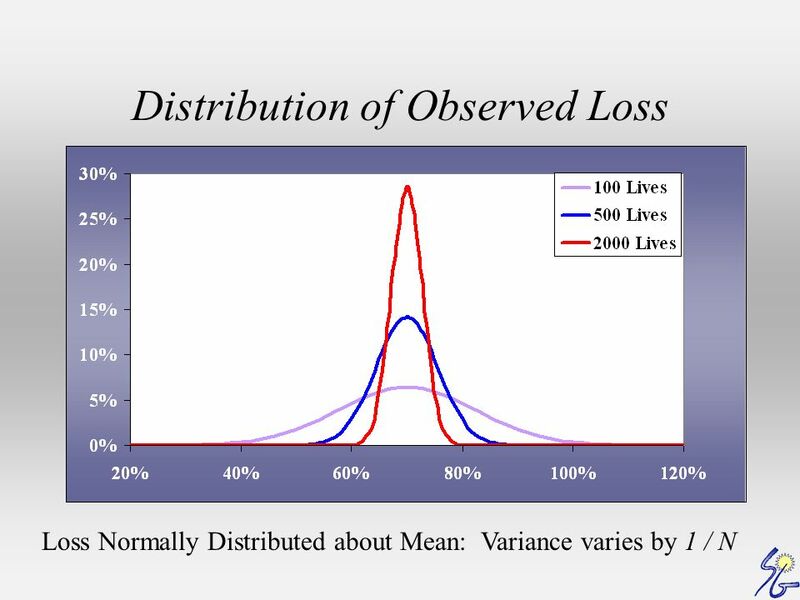 What will be the distribution of the observed loss ratios? 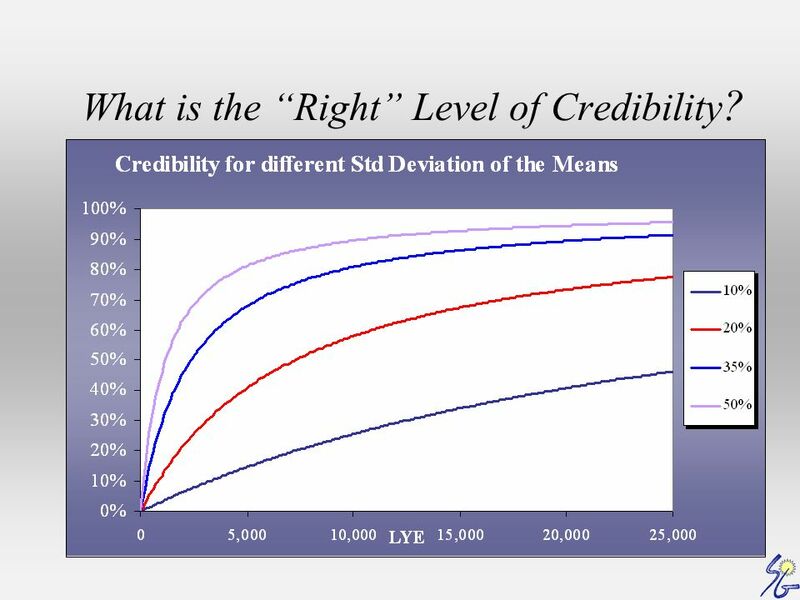 18 What is the Right Level of Credibility ? 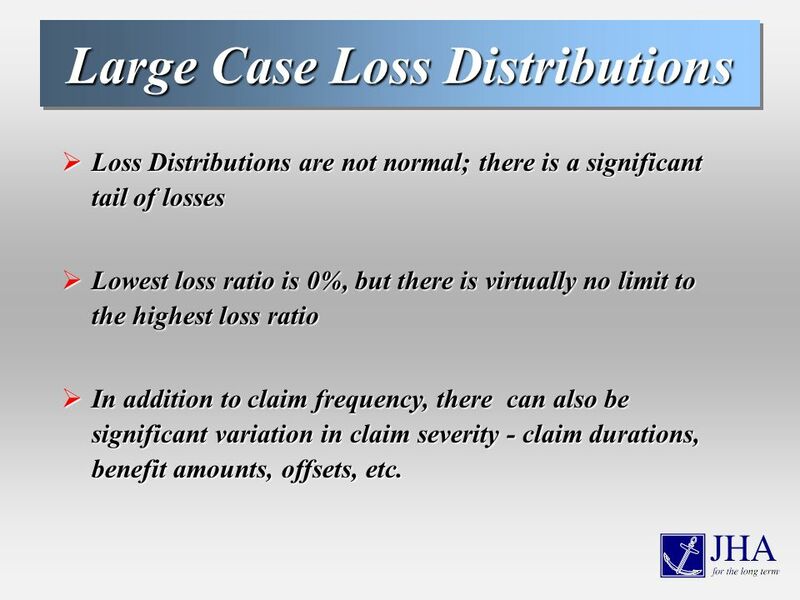 31 Large Case Loss Distributions Loss Distributions are not normal; there is a significant tail of losses Loss Distributions are not normal; there is a significant tail of losses Lowest loss ratio is 0%, but there is virtually no limit to the highest loss ratio Lowest loss ratio is 0%, but there is virtually no limit to the highest loss ratio In addition to claim frequency, there can also be significant variation in claim severity - claim durations, benefit amounts, offsets, etc. 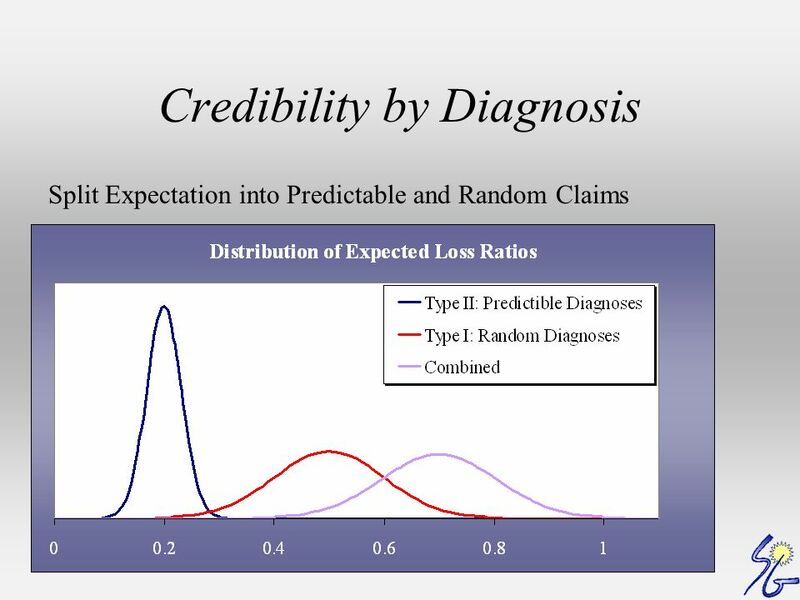 In addition to claim frequency, there can also be significant variation in claim severity - claim durations, benefit amounts, offsets, etc. 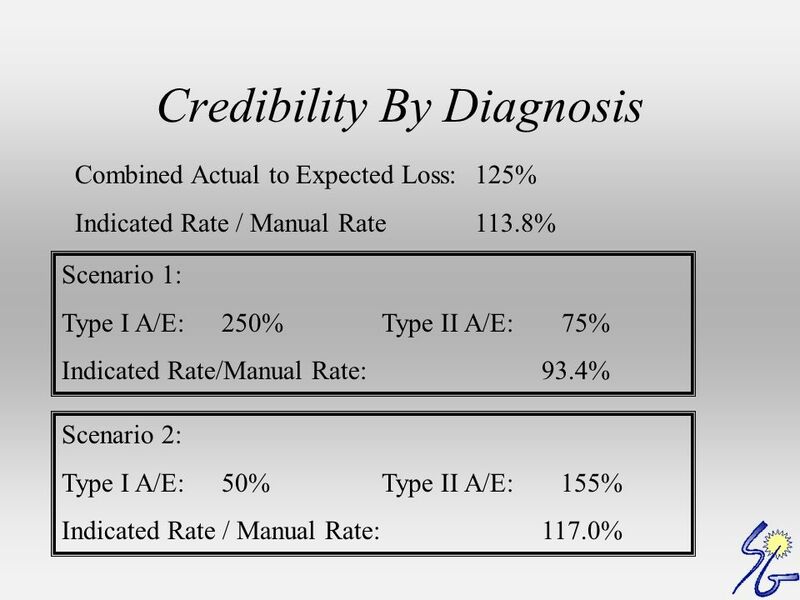 34 ImplicationsImplications If very large claims are to be removed from a particular case, they should be captured on all other cases via a pooling charge If very large claims are to be removed from a particular case, they should be captured on all other cases via a pooling charge Multiple years of experience should be used when available, even on very large cases Multiple years of experience should be used when available, even on very large cases Comparisons to manual provide a base level of expectation to compare experience against - get a census and run a manual rate on every case! 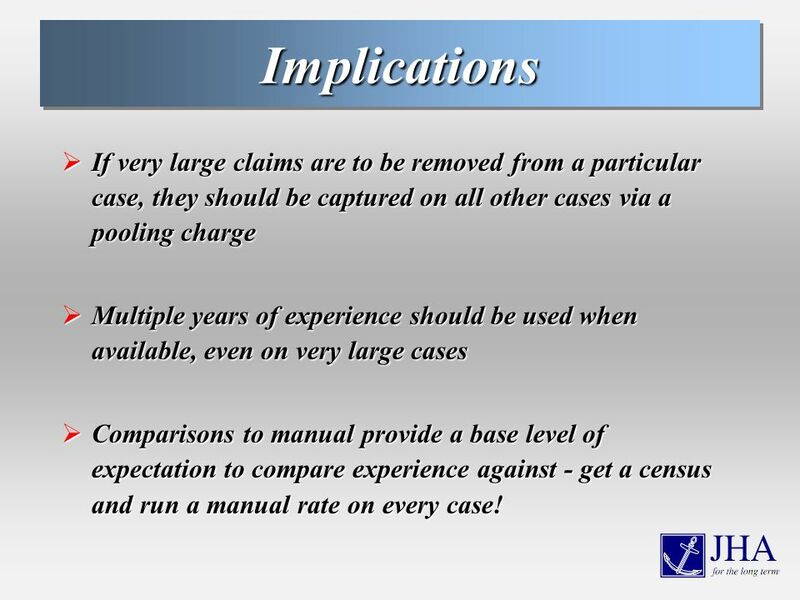 Comparisons to manual provide a base level of expectation to compare experience against - get a census and run a manual rate on every case! 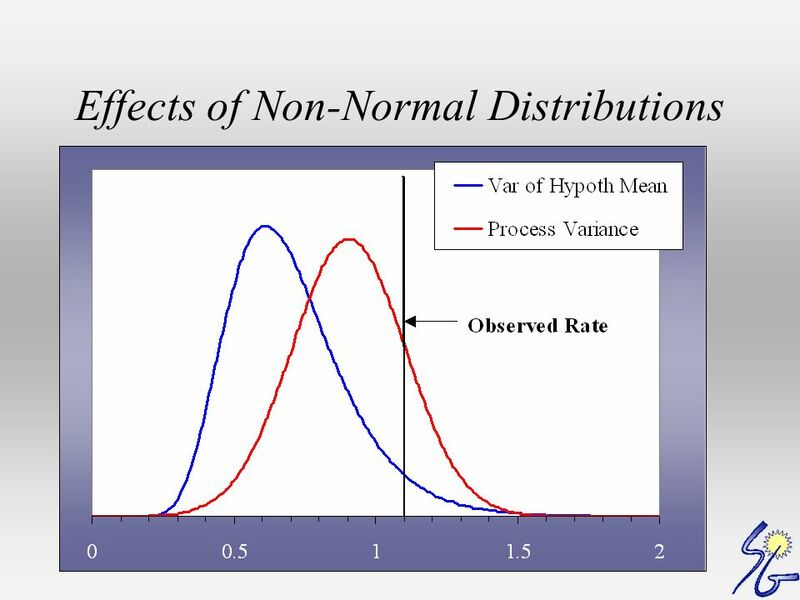 36 Presentation Outline Discussion of Incidence Rate (5 min) Hypothesis test – Is the incidence rate different than the book average? 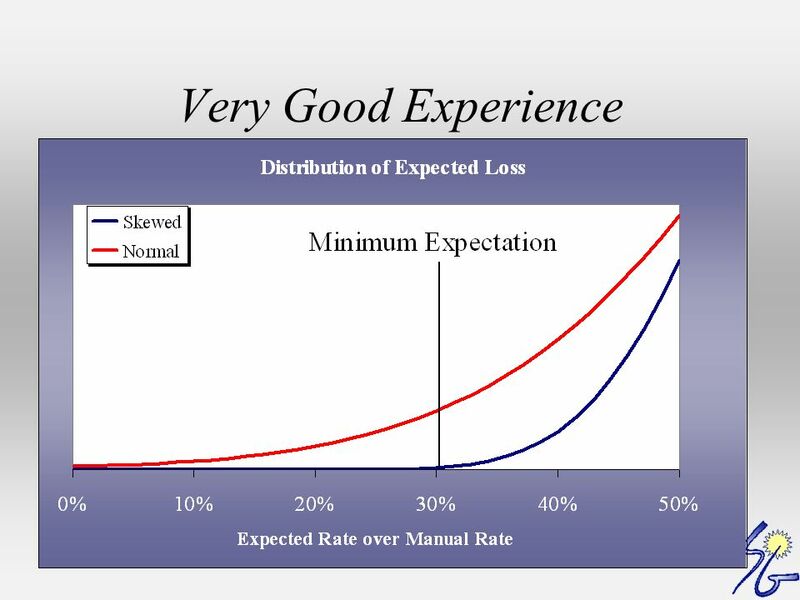 When should adjustments be made? 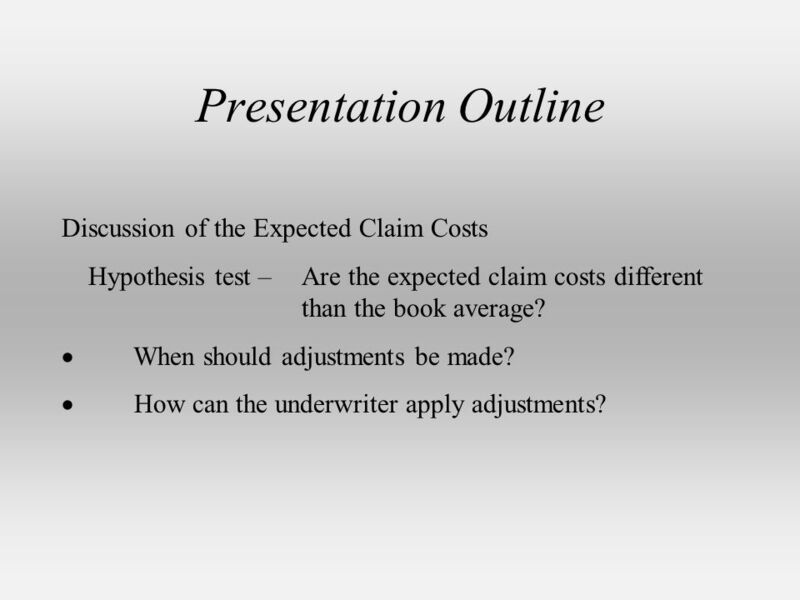 How can the underwriter apply adjustments? 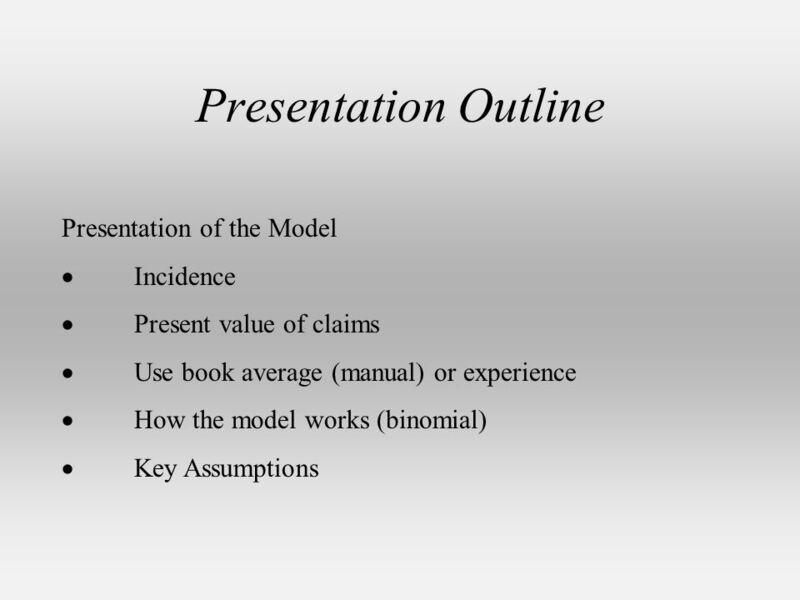 37 Presentation Outline Discussion of the Expected Claim Costs Hypothesis test – Are the expected claim costs different than the book average? 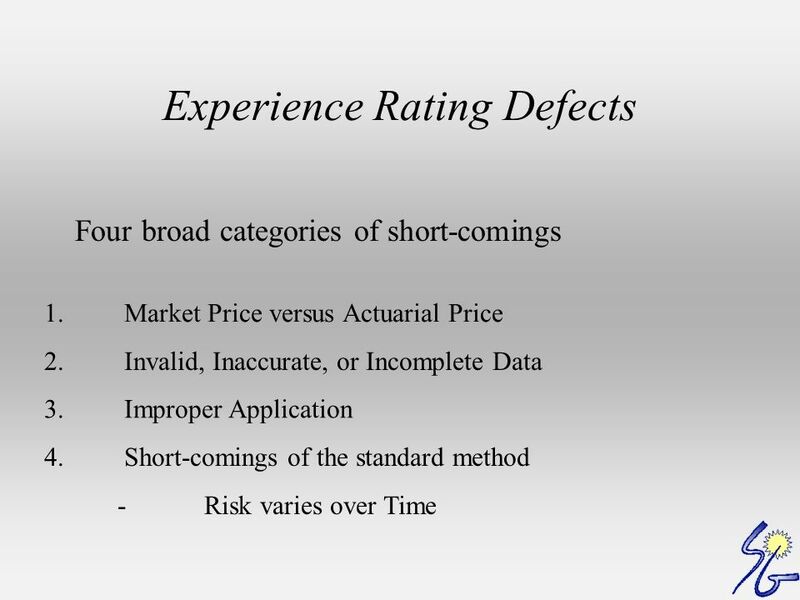 When should adjustments be made? 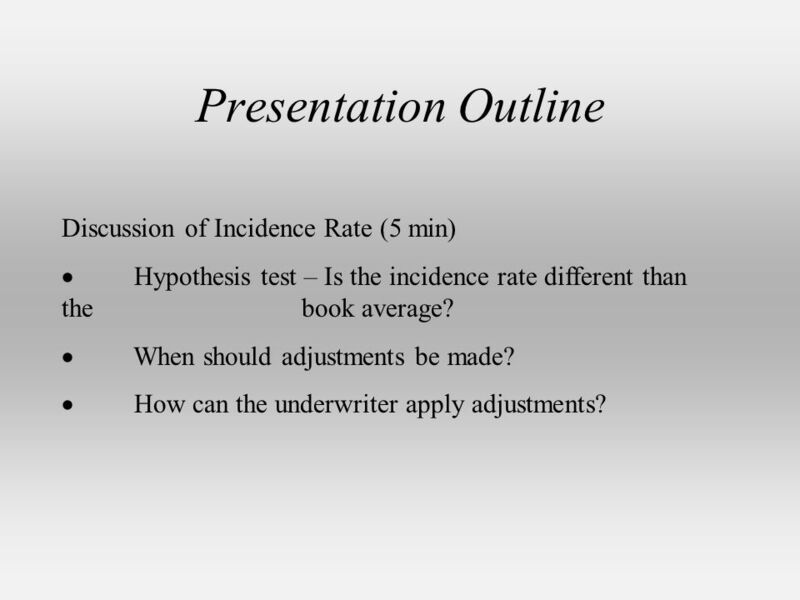 How can the underwriter apply adjustments? 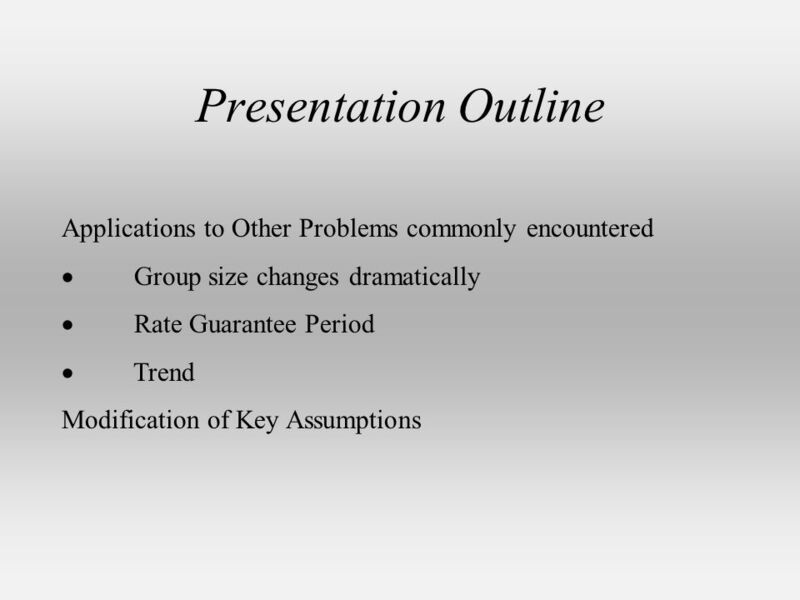 Download ppt "Rick Leavitt – ASA, MAAA - Smith Group Andy Baillargeon – FSA, MAAA – JHA Ben Yahr – FSA, MAAA – Cigna Group Insurance Session 100 2002 SOA Annual Meeting." 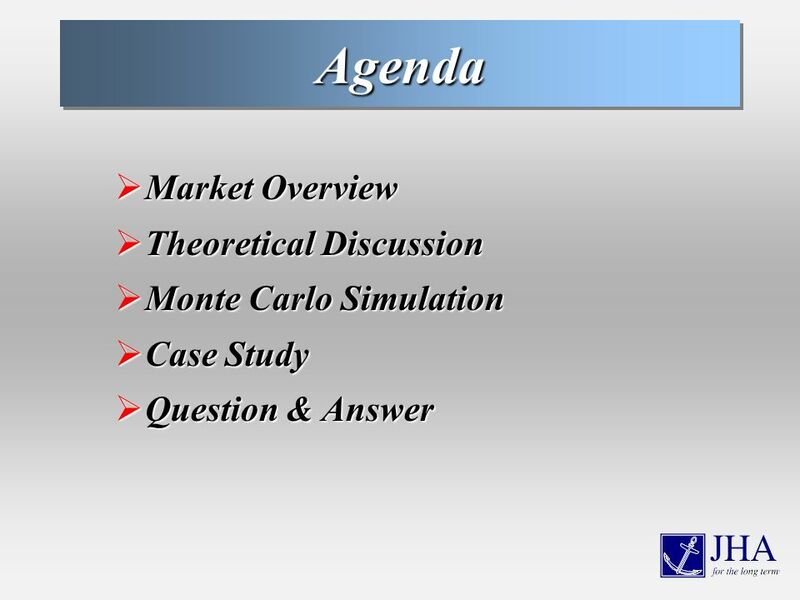 Introduction to Property & Casualty Actuarial Presenter: Matt Duke. 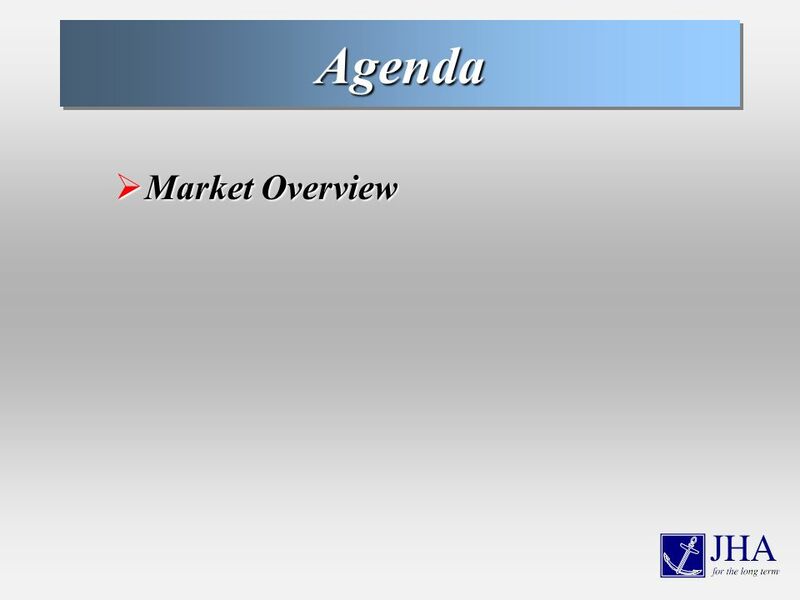 Area Agencies on Aging Insurance and Risk Management Issues by Jeff Cole McNeary Consulting Services. 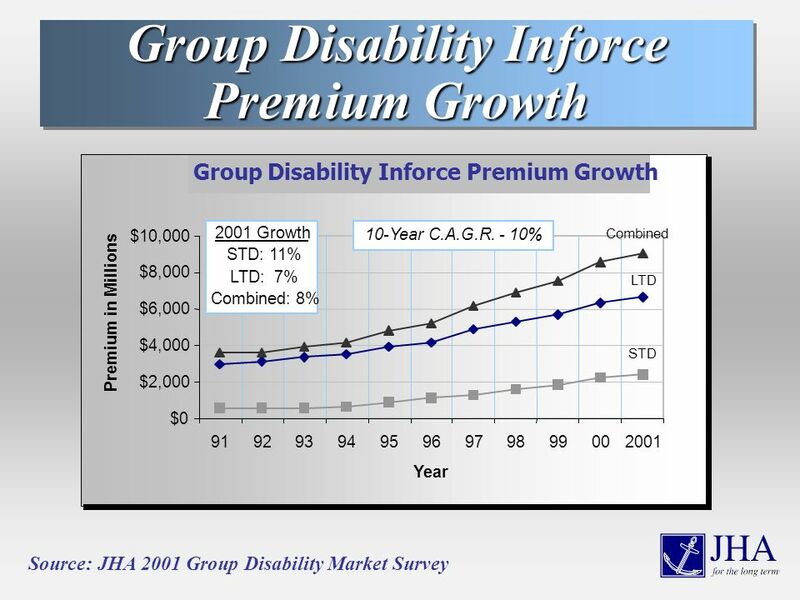 Presented by the Illinois Department of Insurance Andrew Boron, Director November 2012. NH Insurance Department NH Research and Evaluation Group October 21, 2013 Tyler Brannen Health Policy Analyst. 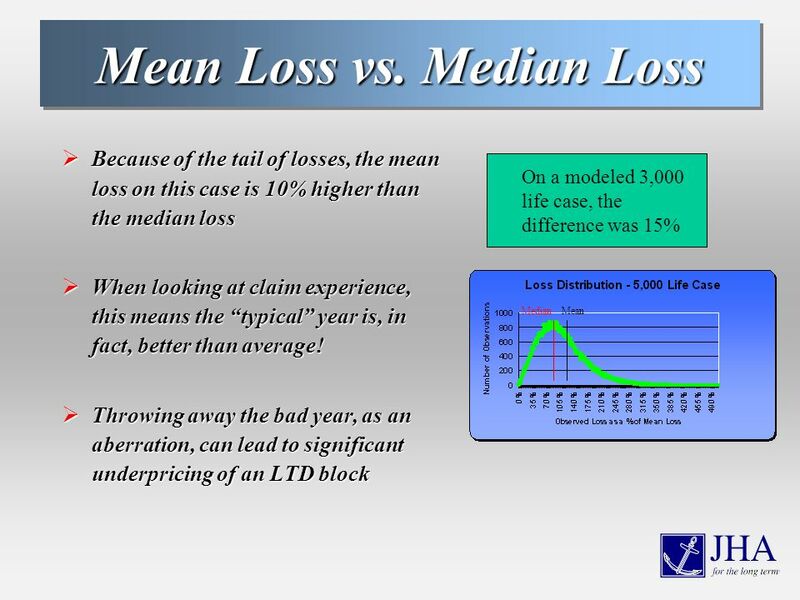 SIIA 30 th Annual National Educational Conference An Independent View of the Stop Loss Market Today October 14, 2010 Actuarial Management Strategies, Inc.
Chapter 9 Accounting for Inventories. Inventory Retailers: finished goods held for sale; balances can be large (77% of current asset & 25% of total assets. 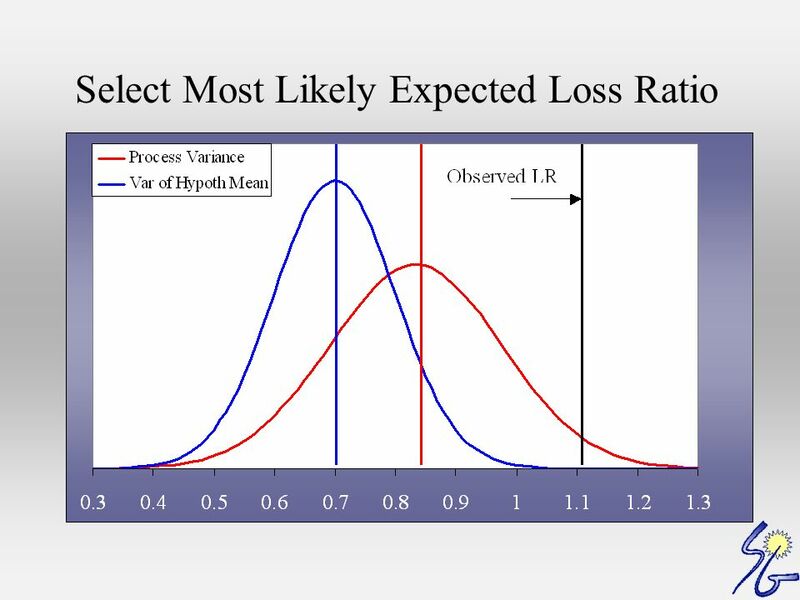 Integrating Reserve Risk Models into Economic Capital Models Stuart White, Corporate Actuary Casualty Loss Reserve Seminar, Washington D.C. 18-19 September.